There are three principal phases of a bull market: the first is represented by reviving confidence in the future of business; the second is the response of stock prices to the known improvement in corporate earnings, and the third is the period when speculation is rampant – a period when stocks are advanced on hopes and expectations. There are three principal phases of a bear market: the first represents the abandonment of the hopes upon which stocks were purchased at inflated prices; the second reflects selling due to decreased business and earnings, and the third is caused by distress selling of sound securities, regardless of their value, by those who must find a cash market for at least a portion of their assets. Charles Dow once wrote, “To know values is to know the meaning of the market.” That quote may surprise trend-followers and adherents of technical analysis, because Dow’s work is often squeezed into a caricature focusing on nothing more than confirmation and divergence across the Dow Jones Industrial and Transportation averages. But Dow’s actual views, best elaborated by writers like Robert Rhea and William Peter Hamilton, were actually about something much more fundamental: identifying the position of the market in its complete bull-bear cycle. That’s a concept that investors have forgotten, encouraged by the illusion that the Federal Reserve’s buying of Treasury bonds is capable of saving the world from any form of discomfort. That illusion is likely to prove costly. Probably the most useful exercise we can do at present is to examine where the markets and the U.S. economy are in their respective cycles – with 19 charts and detailed analysis. The recent bull market clocked in as the longest in history. Even if the September 20, 2018 peak in the S&P 500 was the final high, the preceding advance outlived the 1990-2000 bull market by nearly 8 weeks. Likewise, the current economic expansion is just 3 months shy of the record 10-year expansion that ended in early 2001, the unemployment rate is down to just 3.8%, the entire post-crisis gap between actual real GDP and the CBO estimate of potential real GDP has been eliminated, and the expansion has already outlived the previous runner-up, which ran from 1961 to the end of 1969. As I’ll detail below, the economic expansion we’ve observed since the 2009 economic low has been a rather standard mean-reverting recovery, with a trajectory no different than could have been projected on the basis of wholly non-monetary variables. The primary effect of extraordinary monetary policy wasn’t to drive real economic gains, but instead to amplify speculation and contribute to wealth and income disparities. Wages and salaries as a share of GDP are clawing higher from the historic low set in 2011, but have only begun to erode the elevated profit margins on which Wall Street is basing its permanent hopes and expectations. Still, while it was important to Dow, Rhea, and Hamilton to understand valuations, and to recognize the position of the market in the cycle, they were also carefully focused on the behavior of prices, particularly the uniformity of behavior between their primary indices of interest – the Dow Industrials and Transports. While our own measures of market internals focus on the uniformity of a much broader set of securities, it’s enormously instructive to consider several critical features of market behavior that they understood even a century ago. First, market fluctuations exhibit cycles that move between periods of extreme optimism and periods of profound despair. Second, the extremes of each cycle are characterized by unusually elevated or depressed valuations, and these valuations comprise the true “meaning” of the market for investors. Third, the speculative pressure toward higher prices, and the downward pressure toward lower prices, can be largely gauged by the “uniformity” of behavior across various groups of securities. Fourth, it is enough to identify prevailing conditions and respond to them as they change, without any need to predict the extent or duration of a subsequent market movement. Consider the situation in mid-1929, when, as the market pushed to obscenely rich valuations, Hamilton acknowledged the uniform behavior of the Dow averages, while also carefully placing the advance in a full-cycle context. That uniformity suggested that investors had taken the speculative bit in their teeth, despite the fact that the bull market, in hindsight, would reach its peak only a few weeks later. The 1929 peak occurred on September 3rd of that year, followed immediately by a steep, waterfall decline. Hamilton’s confirmation of a “turn in the tide” was published the next month, on October 25, 1929, the Friday before Black Monday. By then, the Dow was already 20% off its high (that’s what safety nets and tail-risk hedges are for). The Dow would lose an additional 86% before setting its final low in 1932. We presently have a financially disfigured economic expansion that’s three months shy of the longest in history, where the unemployment rate is down to 3.8%, and the most reliable measures of stock market valuation again rival the hypervalued extremes of 1929 and 2000. In this context, to call for an immediate 50 basis point rate cut and a resumption of quantitative easing from the Fed seems a frantic strategy to keep a hypervalued market and two-tiered economic “prosperity” in suspended animation. In a hypervalued market, we do not need to embrace market risk as a result of speculative pressures, but we have to defer an overtly bearish investment outlook on immediate market direction. All of this effort to jam the speculative bit back into the horse’s teeth requires us to adopt a rather neutral outlook here, until we observe fresh deterioration in market internals. Given the late-stage condition of the financial markets and the economy, my sense is that, as in 1929, they may just run this poor horse straight up and over the cliff. We’ll respond to shifts in valuations and market action as they emerge, so forecasts aren’t actually necessary. Still, full-cycle risks have a way of emerging in ways that investors wholly rule out at market peaks. Glorious half-cycle market advances leave investors vulnerable to catastrophe, because investors hold contempt for anyone who suggests there may be a cliff on the other side of the mountain. Still, recall that I openly anticipated the 2000-2002 collapse (which wiped out the entire total return of the S&P 500 – over and above T-bill returns – all the way back to May 1996), estimated an -83% loss in tech stocks at their March 2000 peak (which rather improbably matched the actual loss of the tech-heavy Nasdaq 100), and, after a constructive shift in early 2003, projected the 2007-2009 collapse (which wiped out the entire total return of both preceding bubbles – over and above T-bill returns – all the way back to June 1995). The distressing thing is that, from a historical perspective, all of those losses were rather run-of-the-mill cycle completions. ... the investors at greatest risk in the coming years will likely be those who take solace from Fed easing in environments where valuations are extreme yet investors are inclined toward risk-aversion. 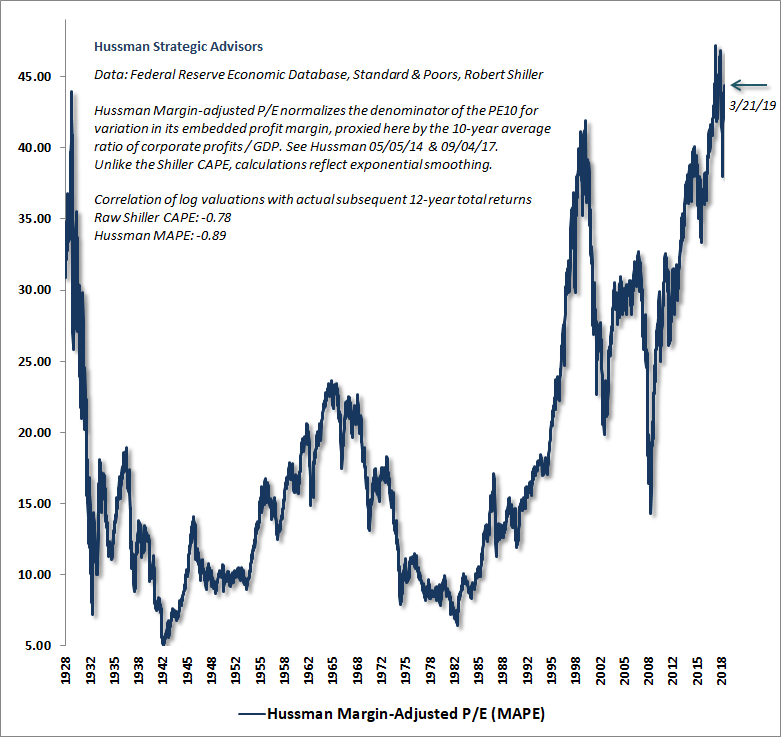 It will be necessary to refrain from too negative an outlook when overvaluation is joined by speculative psychology, and also to refrain from too aggressive an outlook when reasonable valuations are still joined by extreme risk-aversion. In any event, I expect that responding systematically to valuations and market action, particularly the condition of market internals, will be sufficient to navigate whatever policy makers throw at the markets.